Jen is away on a work-related trip so I tonight I came home alone to make dinner for myself. This was a good opportunity to continue working through our massive inventory of food which included roast chicken, one of Jen's least favorite leftovers. I decided that I would give my injured fingers some time to air out, however, I didn't want to use them in the preparation of food given their state. I sliced up some mushrooms and tossed them in a hot pan with some butter to cook while I chopped up the rest of the roasted vegetables from the chicken. 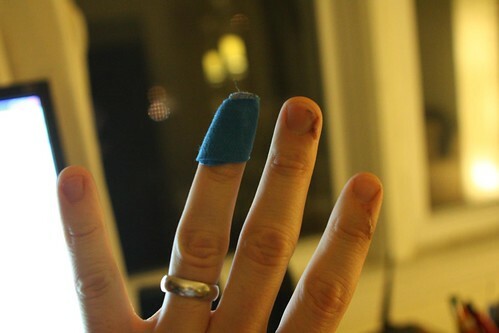 Since I was using my ring finger (previously injured in a car door last Friday night) I was a little unstable and the unthinkable happened -- the knife slipped and sliced the tip of my finger. So, here you have the current state of my hand. Two bruised and recovering fingers accompanied by a now bloody and bandaged third finger. Mr. Pinky, my fourth favorite finger, is still going pretty strong though. I wasn't about to let a setback like that stop me from my mission. I tossed the chopped carrot, onion, celery, and sweet potato into the pan with some of the roasting juices, a little milk, and cream and let it cook down while I added some of the chopped meat. To finish it I threw in some peas. While this cooked down I cut out some rounds of puff pastry and baked them in the oven for a few minutes. 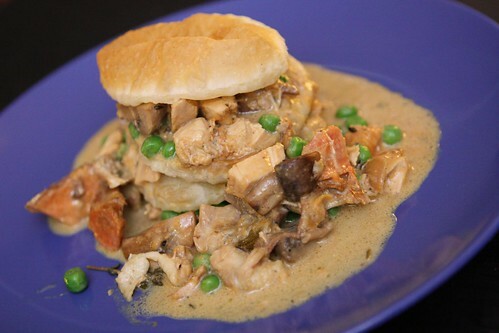 Finally I layered the stew with puff pastry to create this makeshift Napoleon of leftover junk from the fridge. I got through the preparation of dinner tonight but it was really only because I was halfway through when I received my latest injury. I think tomorrow night I might need to go back to what I've been doing for the past few days -- boiled pasta or takeout for dinner. If you're really lucky I won't blog about it.